With its verdant gardens, mausoleum (with sarcophaguses) and a smart tea-room, the Dulwich Picture Gallery seems more like a country town art centre than a London gallery. Yet its quirky contradictions and charm make it appropriate for an exhibition of watercolours by Eric Ravilious, writes John L. Walters. The temporary exhibition space at Dulwich is a perennial challenge for curators: the works are displayed in an interconnecting series of small rooms with the mausoleum’s entrance at its midpoint. 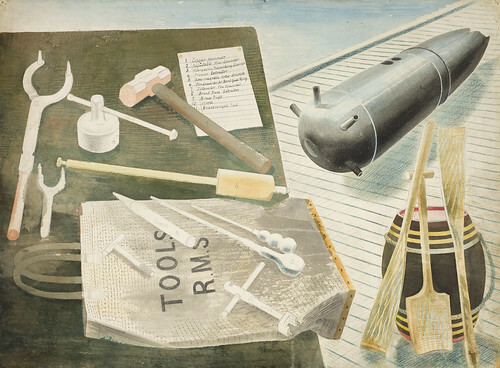 Curator James Russell – who spoke vividly about Ravilious at Eye’s Type Tuesday in March – has dealt with the narrow space by sorting Ravilious’s work into five broad themes: Relics & Curiosities, Interiors, Place & Season, Changing Perspectives, and Darkness & Light. Wet afternoon (1938), private collection. 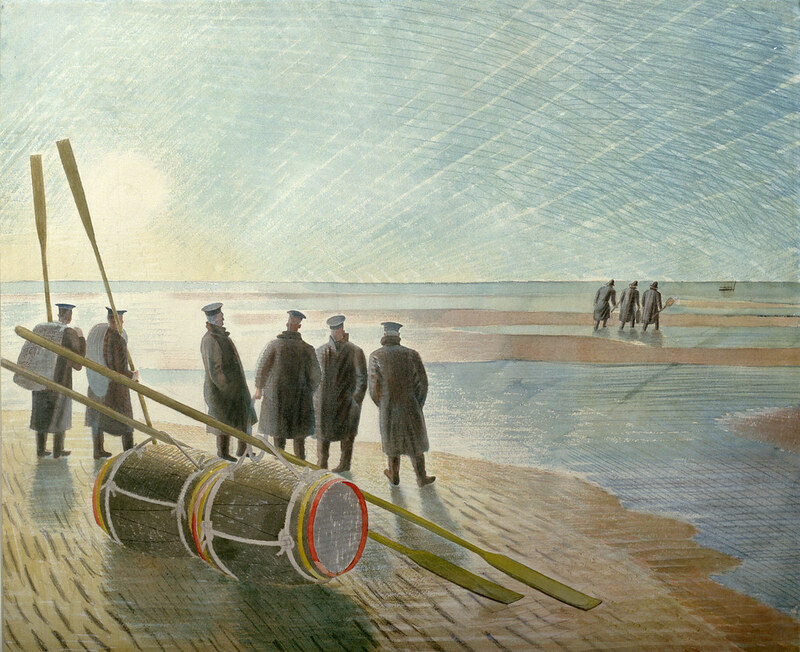 Top: Dangerous Work at Low Tide (1940), Ministry of Defence Art Collection. 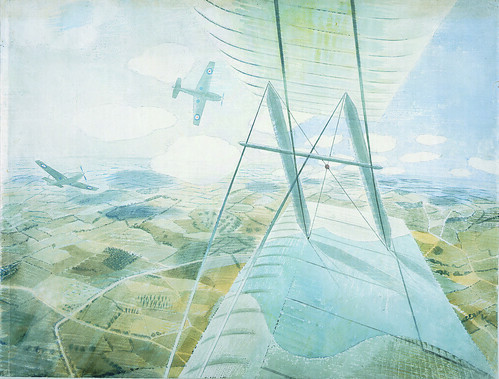 Though the exhibition is about the artist’s watercolours, a medium (fashionable in the late 1920s) that Ravilious made his own, the show also includes a small number of books, lithographs (including the famous ‘Submarine’ series), wood engravings and letters to his wife Tirzah Garwood and lover Helen Binyon. These hint at the broader context of Ravilious’s life and work without distracting from exhibition’s principal focus. 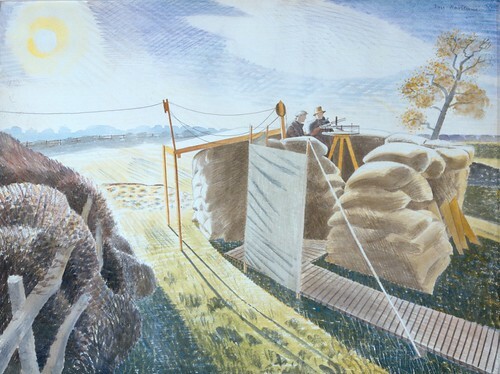 Bomb Diffusing Equipment (1940), private collection, courtesy of Towner, Eastbourne. The mood of the show is cheerful and British, full of pale sunshine and charm. Yet Ravilious, known as ‘The Boy’ by his friends, wouldn't live to be 40; he was one of three official war artists who perished in the Second World War. His wartime watercolours, which conclude each of the five categories, have a compelling strangeness. They also show this complex, fascinating designer-illustrator at the height of his powers. 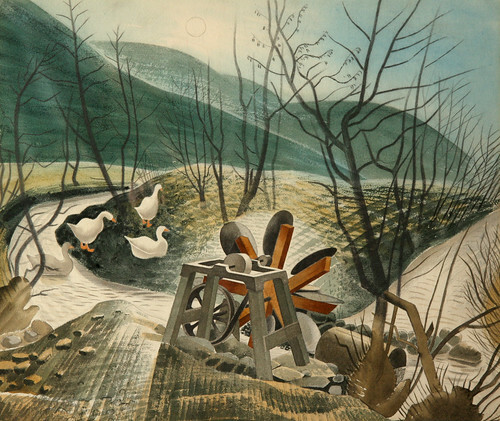 The Waterwheel (1938), Brecknock Museum. 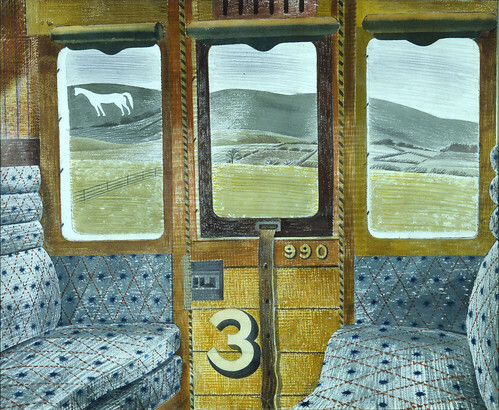 Ravilious created unforgettable scenarios. His vistas of military men waiting on the shoreline, empty beds, abandoned machinery, and desks and teleprinters in shadowed spaces have an odd power that speaks across the generations. His cross-hatched seascapes and madly patterned interiors catch the eye and engage the imagination. Like a frame from a movie, each image has the power to make one speculate on what might have just happened; what could happen next. Hurricane in Flight (ca. 1942), private collection. Ravilious didn't just draw what he saw, he designed what he wished us to see, and he interpreted the adult world with the vivid truth of the best children's illustrators. 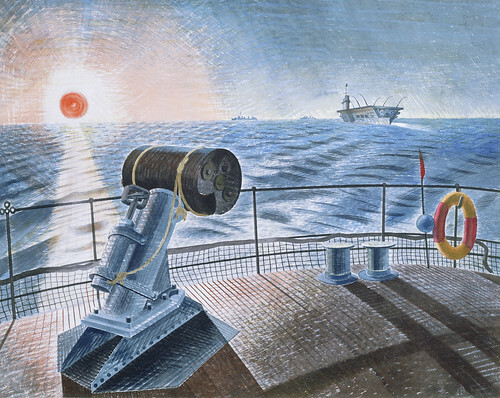 However our enjoyment of Ravilious’s graphic skill and audacious storytelling is tempered by the knowledge that he would not live to experience the postwar peace. He died in September 1942, while on active service as a war artist. He had volunteered to join an air-sea rescue mission off the coast of Iceland; the aeroplane never returned. Midnight Sun (1940). Tate: presented by the War Artists Advisory Committee 1946. Russell’s catalogue Ravilious (Philip Wilson Publishers, £25) includes a biographical essay, extended captions and a timeline to fill in some of the gaps in our understanding of this enigmatic British artist. Observer’s Post (1939). Cecil Higgins Art Gallery, Bedford. In 2017, a group exhibition ‘Eric Ravilious & Co: The Pattern of Friendship’ at the Towner Gallery in Eastbourne will bring together work by Ravilious and his circle, including Garwood, Binyon, Edward Bawden and Peggy Angus. The Towner also has a permanent Ravilious Room. Train Landscape (1940). Aberdeen Art Gallery & Museums Collections. 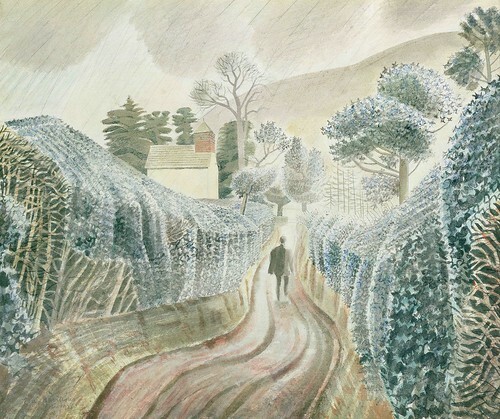 James Russell writes that in 1939, Ravilious’s wife Tirzah Garwood cut and pasted together two versions of this watercolour to create the image we know today.